PCC Engineer Kejin Wang discusses research during a poster presentation at the conference. Simon Anderson presents the keynote to the crowd. The Innovations in Transportation Conference held Oct. 9 and 10 had attentive attendees, full of anticipation about the future of the industry, and active minds. Attention, anticipation, and action were also a theme from the conference’s keynote speaker Simon Anderson, who stressed the “three As” are key to appropriately prepare for the future. His talk to kick off this year’s event was just one of the highlights of another successful conference. 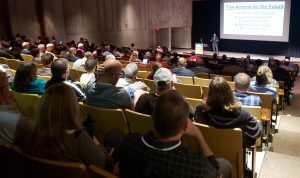 More than 250 attendees came from across the state and country for the two-day conference held in Ames, Iowa to hear more than two dozen speakers offer their assessments of what’s coming down the road in transportation and how agencies can be better prepared. The event is hosted by Iowa State University’s Institute for Transportation (InTrans) and the Iowa Department of Transportation (DOT). Ben Pierce presents to the crowd as part of the conference. “Fundamentally, how we drive is changing,” said Ben Pierce, of HDR, Inc., one of the speakers. Pierce laid out a vision of the future where advances in technology will make connected and autonomous vehicles nearly ubiquitous on the transportation network within three decades. Anderson reminded attendees, however, that whatever changes do come, there will be secondary and tertiary effects to keep in mind. He also noted that changes are likely to happen quickly, using the example of two photographs 10 years apart, where the earlier photo had one motorized vehicle on the street and the latter had only motor vehicles on the same street. The conference speakers stressed how the coming changes are not only innovative but will make the roads safer. 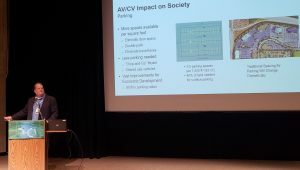 Beyond the safety improvements that will come with connected and autonomous vehicles, speaker Omar Maher, of Esri, highlighted how the rise of big data can be used by agencies to identify crash clusters to make necessary changes. The conference also featured a reception and poster presentation. The posters showcased the work of InTrans staff and their innovative research. The variety in perspectives of the speakers and in the posters was another highlight, where attendees could hear from transportation agencies, the vehicle industry, and researchers to get insights into how all stakeholders can have a part in an innovative future of transportation. The panel discussion closed out the two-day event. 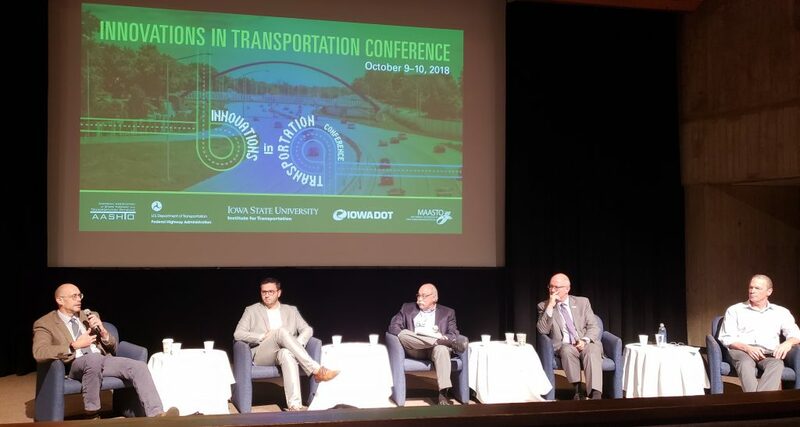 The interaction among participants was particularly evident in the transportation leaders’ panel discussion with Iowa DOT Director Mark Lowe, Federal Highway Administration Chief Innovation Officer Tony Furst, Michigan DOT Director Kirk Steudle, and Mahar, of Esri. The speakers each came with different perspectives on leadership but optimistic visions about the innovations that are just around the corner. JD King of Page County presented at the Pavement Preservation workshop held after the Innovations conference. Several attendees who joined the Innovations in Transportation Conference stayed after the event ended for another workshop. 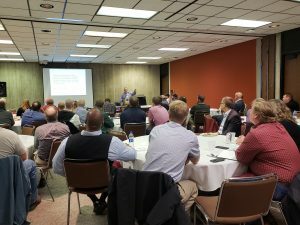 The Iowa DOT, Iowa Local Technical Assistance Program (LTAP), and InTrans held a half-day Pavement Preservation Tools Workshop that started just after the panel discussion closed out the Innovations conference. The workshop focused on pavement assessment applications and when, where, and how pavement preservation should occur. The presentations included both asphalt and concrete pavement innovations and the effectiveness of pavement preservation.